The final result of Martsinkevich’s cosplay is what’s commonly recognised as blackface—when a non-black person attempts to caricature or present as a black person. It originated in the 1800s when white actors used shoe polish or burnt cork, sometimes on top of highlighting their lips or other features, to perform exaggerated and racist stereotypes of black people. 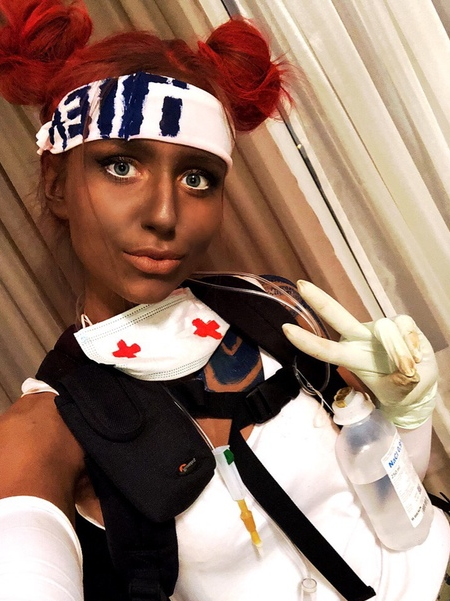 Martsinkevich’s stream was taken down before she could finish her cosplay preparation in what constitutes a direct denouncement of blackface on Twitch. After announcing her apparently 30-day suspension, Martsinkevich posted a YouTube video in which she explained that she was banned for “engaging in hateful conduct against a person or group of people.” She went on to contend that she “just wanted to be similar to Lifeline from Apex...it wasn’t meant to have [sic] a joke of anyone. It was just a cosplay, guys, for my favourite legend from a computer game.” The Twitch streamer says that she didn’t mean for her cosplay “to be painful for anyone” and apologised to those who were hurt.